This post is sponsored by Applegate, however, I am sharing my own thoughts. All opinions are my own. 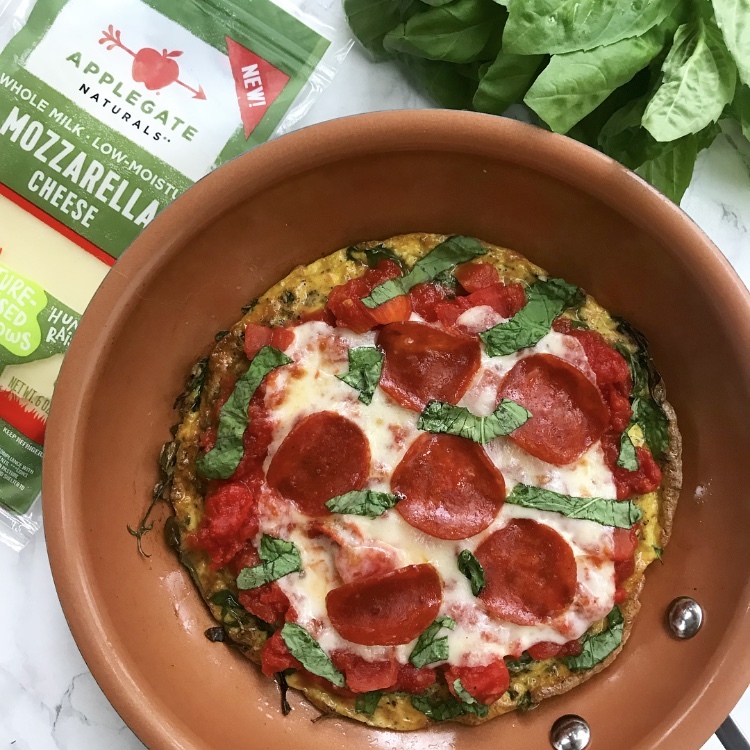 Applegate has been a go to in my kitchen for years with their natural and organic meats, so you know that I was super excited to learn about their new sliced and shredded cheese line! They are expanding their core values and the high quality standards upheld by their meats to cheese sourcing and production with a transparent, traceable milk pool. Applegate Naturals® Sliced and Shredded Cheese comes from the milk of pasture-raised cows living in small herds on independent, family-owned farms. These cows are humanely raised and never administered antibiotics or growth hormones. This cheese is the brand’s first ever to be Non-GMO Project Verified, and it has no added colors, preservatives, or artificial ingredients. There are six new sliced varieties – Medium Cheddar, Provolone, American-Style Colby, Muenster, Pepper Jack, and Mozzarella. Sliced Swiss will be released in 2019. There are also three shredded cheese offerings – an Italian blend, Medium Cheddar, and a Mexican Blend. You’ll be able to find the new cheese lines at selected retailers including Whole Foods Market, Publix, and Sprouts. You can also find more information by visiting www.applegate.com. To celebrate the launch, I decided to make a fun and delicious recipe using their new sliced mozzarella (and turkey pepperoni). Pizza is always an easy and delicious go to, and breakfast is probably my favorite meal of the day. So I figured why not combine them? I whipped up the perfect, easy pizza frittata for two! It packs in the protein and makes it easy to enjoy guilt-free pizza for breakfast! 1. In a small oven-friendly skillet, heat up the EVOO over medium high heat. 2. Add in the chopped garlic and arugula, and cook for 2-3 minutes until the garlic starts to turn golden and the arugula cooks down. 3. In a bowl, whisk the eggs with the Italian seasoning, salt, and pepper, and pour the mixture over the arugula and garlic. 4. Cover and cook for 3-5 minutes on the stovetop until the sides are cooked (but the center is still raw). 5. Place the pan in the oven on broil, and cook for about three minutes. The eggs should be cooked on the top but still a light yellow. 6. Remove the pan, top the eggs with the diced tomatoes, sliced cheese (feel free to add in an extra slice if you’d like! ), and pepperoni. 7. Place the pan back in the oven for another 3 minutes or so until the cheese melts and the eggs begin to turn golden brown. 8. Remove the pan, and top with fresh basil. Slice the frittata in half, serve, and enjoy! Feel free to share the other half with someone special (delicious cheese fans recommended)! Let me know what you think in the comments below, and make sure to check out www.applegate.com for more info on their delicious cheese and meats! The holiday season is very much upon us, and that has me in the mood for all of the holiday party dishes! Naturally, I headed to my local Whole Foods to pick up some fresh and seasonal products to make a dish that I'll be serving at my holiday dinner this year, a winter veggie baked ziti. They had everything I needed from organic pasta to sauce to seasonal fresh veggies and cheese. Plus you can even order online at the Whole Foods Market E-Store! We all know how hectic the holiday season can be, so WFM is making it as easy as possible. For this dish, I decided to go with some of my favorite seasonal veggies - brussels sprouts, cauliflower, kale, and mushrooms. 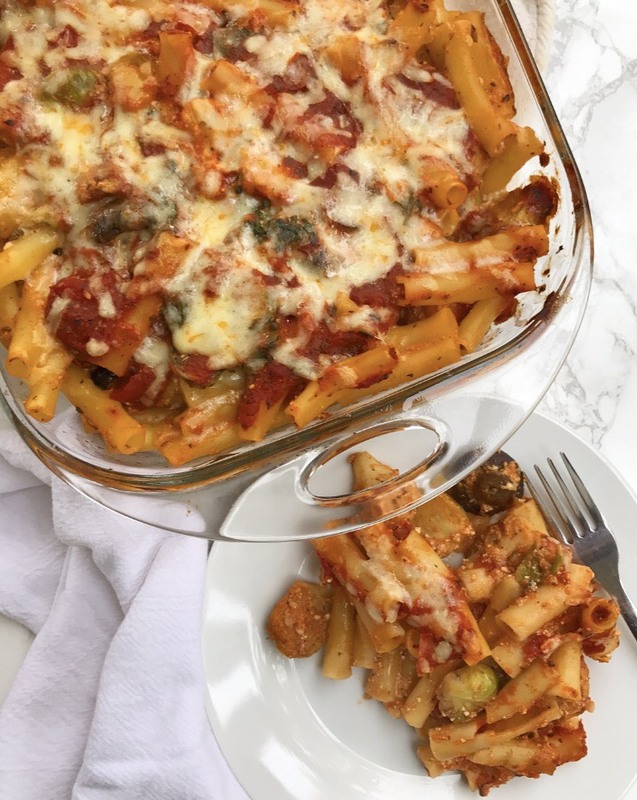 They all remind me of this time of year and would make for the perfect healthier baked ziti dish. Mix in some pasta, sauce, and cheese, and you have yourself a a veggie-packed meal that even the kids will love! It really is the perfect easy-to-make main course for any holiday gathering. 1) Toss the brussels sprouts, cauliflower, and mushrooms with 2 tbsp avocado oil, 1/4 tsp oregano, 1/4 tsp basil, sea salt, and pepper, spread the veggies on a baking sheet, and roast in a preheated 425 degree oven for 25 minutes. Once done, decrease the temperature to 375. 2) While the veggies are roasting, cook the pasta according to the instructions on the box. 3) In a large pan on the stove top, heat up 1 tsp avocado oil over medium high heat. Add in the 3 cloves of minced garlic and 2 cups of kale. Cover and cook for about 5-7 minutes, stirring occasionally. Remove from heat. 4) Reserve 1 cup of marinara sauce from the 25 oz jar. 5) In a large bowl, thoroughly mix together the cooked pasta, roasted veggies, sauteed garlic and kale, 1 cup shredded mozzarella, 1 cup ricotta, marinara sauce (minus the 1 cup), egg, 1/2 tsp basil, 1/2 tsp oregano, sea salt, and black pepper. 6) Pour the mixture into a large, greased baking dish. 7) Top the mixture with the reserved cup of marinara sauce and 1/2 cup shredded mozzarella. 8) Bake the dish in the preheated 375 degree oven fro 30-40 minutes until fully cooked through. I hope you enjoy this veggie-packed, healthier version of the classic! It's sure to be a crowd pleaser this holiday season. Let me know what you think in the comments below, and don't forget to check out your local Whole Foods Market or the Whole Foods Market E-store for all of your holiday food shopping needs! So the number one question I'm probably going to get is WTF are currants? Honestly, I didn't even know myself until about 2 days ago. I stumbled upon some red currants at a small, local market when I was looking for blueberries and was intrigued. Obviously I googled them, and one of the first things that popped up was, "If you find local currants, buy them!" So I followed suit, snagged my currants, and headed home. Side note - they were gone in 2 days. From what I read, they seemed like tart berries, so I played around with them in the kitchen for breakfast. I loved the breakfast; My niece did not. Needless to say, they're definitely tart. So I figured the perfect way to balance out the tartness would be to put them into some delicious, sweet muffins. They did not disappoint! I made them gluten free and dairy free, and they are still so perfect and moist (sorry for the use of the word, but they are). Plus the sweet and tart balance is on point. And if you aren't feeling the idea of tart currants or just can't find them, feel free to swap them out for the berries of your choice. I'd imagine blueberries would be a great sub. 2) Mix together all ingredients minus the currants until smooth. 3) Fold in the currants (may reserve a few to place on the tops of the muffins). 4) Evenly disperse the mix in a 6-cup muffin tin. Optional - top each with reserved currants. 5) Place the muffin tin into the preheated oven and bake for 20-25 minutes until muffins are fully cooked through. 6) Remove the muffins, serve, and enjoy! These muffins make for the perfect snack, treat, on the go breakfast, or even dessert! I haven't tried subbing other flours or milks, but I will update this post if I do. Or feel free to let me know how it goes in the comments below! I would also imagine the ghee would work as a sub for coconut oil as well as a vegan egg for the egg, but again, I haven't tested it out yet. Let me know what you think in the comments below! This post is sponsored by Barilla; however, I am sharing my own thoughts. All opinions are my own. Spring is finally upon us, and I couldn't be more excited! That means fresh, bright produce and lots of outdoor time, so I decided I needed a recipe that celebrates all of the above! And what screams spring time picnics more than a fresh, veggie-packed pasta salad dish? I had recently stumbled upon Barilla ProteinPLUS pasta at my local Walmart. It's packed with 17 g of protein (per 3.5 oz portion) from all natural vegetarian ingredients including egg whites, grains, lentils, and chickpeas. It's also a great source of fiber and ALA Omega-3. 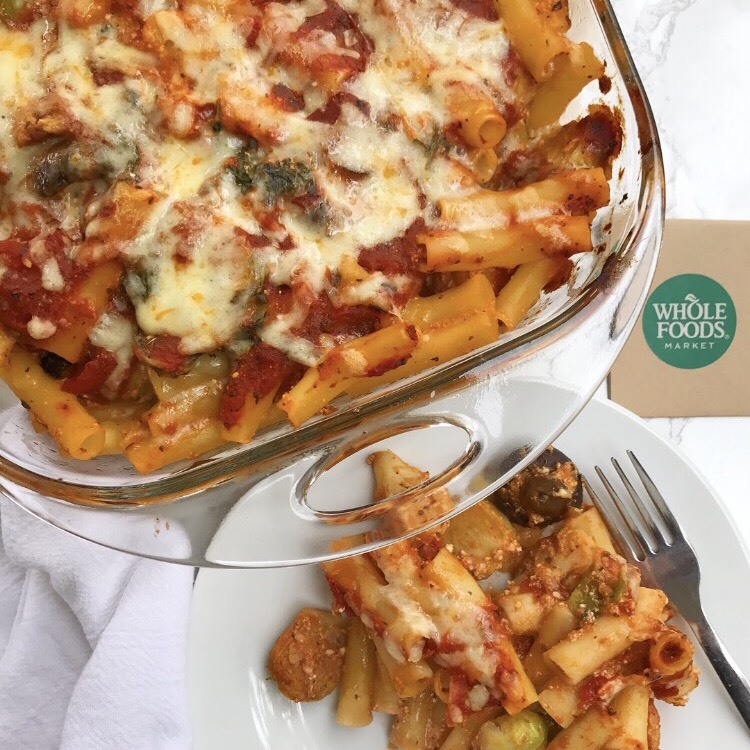 It seemed like the perfect base for a quick, easy, and delicious meal any day of the week, so I ended up picking up the penne to give it a try. I thought it would pair perfectly with some bright spring veggies like asparagus and tomatoes to make a light and fresh pasta (or pasta salad) dish while still being a good source of lean protein. I added in some lemon juice, pine nuts, basil, and a few other ingredients to bring that extra flavor, and it all came together to make a great meal or side that'd be perfect for your next picnic! 1) Cook the Barilla ProteinPLUS Penne according to the directions on the box. 2) Remove the bottoms from the asparagus, and bake them in a preheated oven at 400 degrees for 10 minutes (may also grill or steam until tender instead). 3) Cut the asparagus spears into thirds. 4) Toast the pine nuts on the stove top until they begin to turn golden (about 3- 5 minutes). 5) In a large bowl mix together all of the ingredients until well blended. I reserved some of the pine nuts, basil, and parmesan to top it all off, but feel free to mix it all in if desired. 6) Serve warm or refrigerate to serve as a pasta salad, and enjoy! Barilla Gluten Free pasta was recently named one of Parent's Magazine's "Top 25 Allergy Free Foods" making it a great choice to swap in for the ProteinPLUS penne if allergies are a concern! You can also use this Ibotta link to get some cash back when purchasing your Barilla pasta. Make sure to check out these other delicious Barilla recipes and their Pinterest board for more inspiration! And let me know what you think in the comments below!